This dinner dates back on January 16, 2009. Yes, it’s a bit dated but it’s still valid when you look at their current menu. About a month or so, in December, Patrick (if you look back at the Alta post, that’s when I knew him) and I chatted online like we usually do on a workday. The surprising thing he told me was he’s coming to visit New York City for the weekend. I was happy since I haven’t seen him for nearly a year or so and he wanted to eat dinner. Somewhere. I scratched my head a bit and tried to think of vegetarian-friendly places that would appeal to him and my meat-liking self. 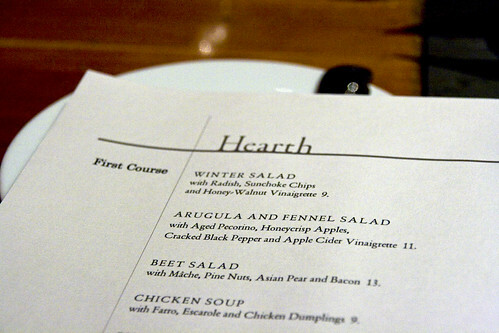 Of the bunch of places I’ve thought up of, we settled on Hearth for its delicious sounding menu. I also wanted the highly touted cider donuts. In case you don’t know this by now, I love desserts. 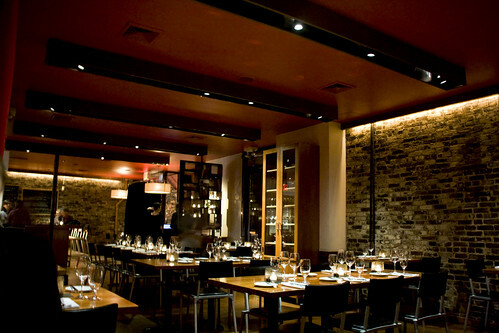 Hearth’s interior looked very handsome and welcoming. Brick walls with warm, wooden-beamed ceilings. The wall beside us (not pictured) were lined with large squares of felt or velvet. Also, if you looked toward the part of the room where it’s facing Second Avenue, there’s a large cauldron hung up on the wall. When we’re seated and given menus, Patrick and I didn’t bother staring and contemplating much as to what we should order – we’ve made our decisions practically a week ahead. All we did was chat and catch up a bit until the waiter came back and inquired what we would like to have. 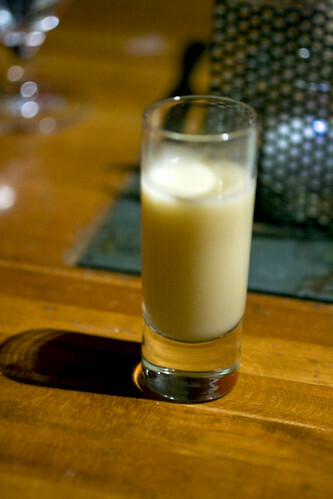 The amuse of the evening was parsnip soup served in a shot glass. 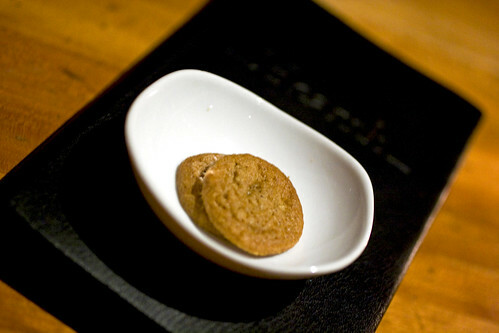 It’s simple, unpretentious in presentation but very flavorful and creamy. We liked it a lot. Patrick was a bit shocked that he liked this soup because he normally doesn’t care much for parnsips. As for our appetizers, Patrick and I ordered from their side dishes portion of the menu. He ordered the hen of the woods. Trying a mushroom, this was great. 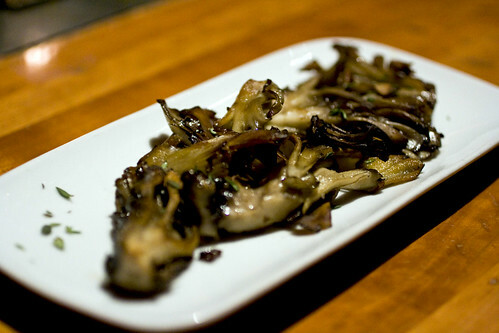 Tender, flavorful with a touch of buttery silkiness. As for me, I had the gnocchi. I italicized gnocchi because it’s another one of those dishes that I’ve heard that one must get at Hearth. Was it worth the hype? Simply stated, yeeess. 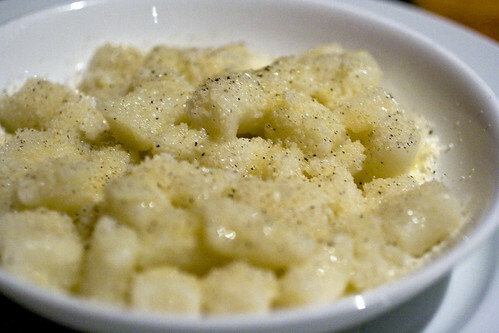 These little bite-sized clouds speckled with parmesan cheese and pepper, lightly coated with butter sauce were awesome. I had to pause a moment every time I took a forkful of these delicate yet rich babies. 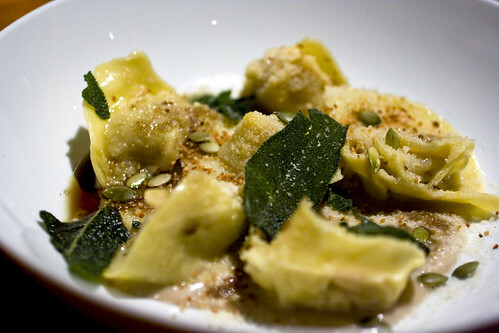 Moving onto our entrees, Patrick ordered the pumpkin tortelli. Never having the combination of pumpkin and pasta before, he’s blown away. Al dente pasta stuffed with pumpkin-y filling with hints of sage, amaretti, and chestnuts. Everything was balanced in terms of sweet and savory flavors. Me being the carnivore that I am, I ordered the braised veal breast. The chilly weather is making me crave something stewed or braised. Anyway, this tender, rolled up breast meat was juicy and flavorful. My favorite part was the nugget of creamy sweetbreads. Man, I wanted more. 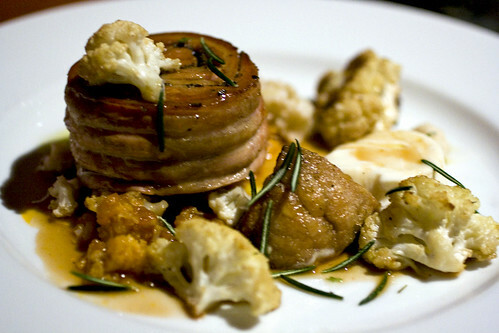 The cauliflower balanced out the meatiness of the dish and it played on the sweetness of the meat and added a subtle crunch. 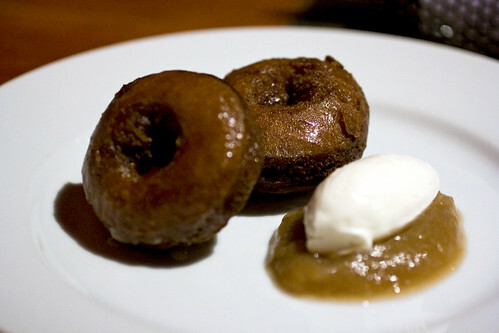 As we progressed onto dessert, Patrick and I split the apple cider donuts with apple compote and maple whipped cream – Hearth’s signature dessert. And indeed, it should be. Just taking a bite of the warm donut (complete with an über thin crust and soft, pillowy crumb) with a smear of gently sweetened apple compote and whipped cream my mind went to “OMG…! to [brain went flat-line]” It was a roller coaster ride of euphoria. Words cannot express how awesome this dessert is. You just have to try it. Recovering after the first few bites of the aforementioned donuts, we remembered the colorful yet seasonal sorbet sampler were near us. 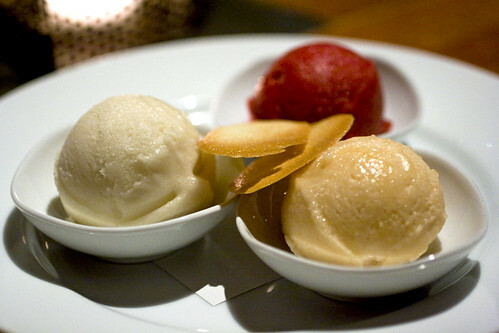 The three scoops consisted of cranberry, quince, and spiced pear served with two delicately buttery tuile cookies. The most poignant thing I remembered from the three sorbets, besides it being almost sherbet in texture, was the spiced pear scoop. It tasted like Patrick’s jarred pears he sent me for my belated birthday present – intense pear flavor with a kick of cinnamon. It surprised both of us when we thought about it. Your pictures are amazing. We were excited to see your blog post on Hearth — we were just there a few weeks ago. We had the lamb! Chris Ann & Kristin: Thank you!